Pop-up cinemas are an in thing nowadays, however a professor from a London University offers people an unconventional way of watching a movie. 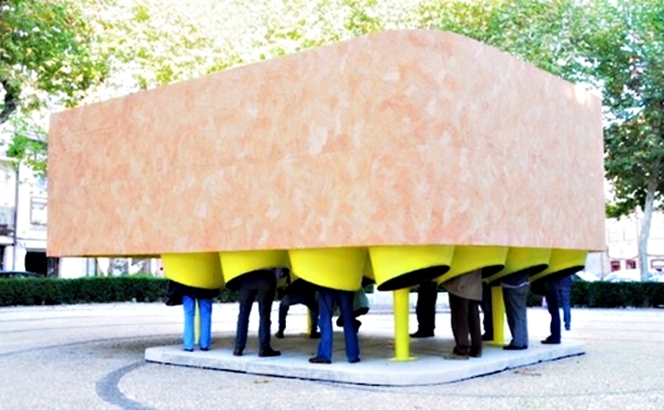 The “Centipede Cinema” is a mobile, pop-up cinema, conceived by Professor Colin Fournier from Bartlett School of Architecture. He seeked the help of Polish artist Marysia Lewandowska and London studio NEON, to create a free standing cinema that is made of a steel frame and a canvas and cork structure. It features 16 nozzles, where viewers have to enter to watch a movie. They can be seen standing up, with only their legs exposed. Once inside the nozzle, they will be treated to an hour-long film movie that is composed of of 20, 3-minute trailers, chosen by local workers. The “Centipede Cinema” is currently situated in Guimarães, Portugal.